I wrote a bucket list today. It includes writing goals (publishing one of my novels) as well as other neat non-writing things. I hope I keep seeing this list as a way to focus on my goals. I hope I keep adding to this list as long as I am alive. I hope I always reach high. Fly a Fighter Jet – I actually found a place and plan to do this next year. Drive a Tank – Not next year, but I totally found a place that will rent you one. Combat Training – no, really, how cool is that? 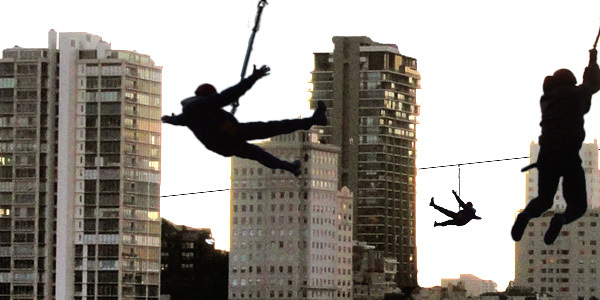 You may wonder about the last item on this list…after all how realistic is it to take a zip-line to work? Well, you see in my current job I can actually see my office from my deck (I live on the 17th floor of one building with a great view of my 15th floor office in another) with little between us but air and a few low rise buildings… So what I’m saying is I have a viable down-slope possibility… I have even suggested the zip line option to my boss several times with no success yet, but I’m still working on it. When he agrees I will have the coolest commute ever. It will take some infrastructure work up-front, but I think the whole world will benefit. Why? I’ll be happy and let’s face it, any time I’m happy there’s a ripple effect. Imagine the benefits in the event of a zombie apocalypse. I could totally be the new transport choice of the survivors. A brand new solution for growing urban density…all that space over the streets is just going unused. Um…zipline to work…need I say more? Cool things are just good for the Universe. But even if I never convince my current employer of the universal benefits of a zip-line to work, maybe when my novel hits the best seller list I can buy land with big trees, make an Ewok village, and live the dream that way. When I googled Ewok village to get the last link, I found this…an Ewok style village practically in my own back yard, now think how this would help urban density. This zip line thing is more of a possibility all the time. Do you ever people watch? I love to sit and watch the world around me, although I rarely take time for this pleasure. Each person has a story, and often just sitting quietly with a coffee in a public place I hear things that make my imagination take flight. Take your writing out to a public place where you will see people passing you. Get comfortable and then watch the people in your environment. Choose one person and tell their story. I am not asking you to talk to this person and tell their real story. I’m asking you to let your imagination be inspired by what you see. Aim to spend thirty minutes on this exercise. Happy writing.